A exclusive conversation with food safety czar David W.K. Acheson, FDAs Associate Commissioner for Foods. Diane Toops, our News & Trends Editor, recently sat down with David W.K. Acheson, FDA’s Associate Commissioner for Foods. FP: In May 2007, you were appointed you to the new position of Assistant Commissioner for Food Protection. Then in January this year you became Associate Commissioner for Foods, to provide guidance on food safety and defense strategies. What was your immediate focus? DA: The first focus was to develop an integrated Food Protection Plan for FDA that needed to embrace both food safety -- the unintentional part of food contamination -- and food defense – the intentional piece -- linked together under food protection. Commissioner Andrew von Eschenbach [Acheson’s boss] set up the new part of this position to raise the profile of food issues into the commissioner’s office, which it hadn’t been before, and integrate the various parts of the agency that deal with food for humans and for animals. We’re dealing with the Center for Food Safety and Applied Nutrition on the human side, Center for Veterinary Medicine on the animal side, the Office of Regulatory Affairs, which deals with inspections, National Center for Toxicological Research, the research arm of FDA in Arkansas and various other components, like Office for International Programs and Office of Crisis Management. It was a central role to integrate, organize and develop a strategic vision of where we should take the agency in the future to protect the food supply. That resulted in the Food Protection Plan. FP: What are the core elements of the Food Protection Plan? DA: A high-level strategic vision of the approaches to protect the food supply, it is built on three core elements: prevention, intervention and response. Prevention is all about building safety up front. Intervention is about risk-based targeting of inspections sampling and getting a handle on problems early on. When something starts to go wrong, how do we get in there quicker in tracking adverse events, consumer complaints and the results from samples? The third element is response. When you have a situation and need to respond, how can you do it more efficiently, faster and improve the communications up and down the channel, sideways to consumers, to industry and regulators as part of the response? One of the big shifts for FDA was to put more emphasis on prevention. We’ve always worked on trying to build preventative strategies because that’s clearly the smart way to go, but this plan is a deliberate shift to put more focus on prevention – both domestic and imports. Much of the plan is focused on how we deal with the global food supply. The reason we developed the plan was to respond to many global changes and challenges – rapid distribution, changes in distribution practices. The global food supply is a huge part of that with the increasing number of imports and increasing susceptibility of the population. There are multiple things going on that needed a new approach. FP: Consumer confidence has been shaken by a number of high-profile food safety scares, 57 percent of Americans think imported foods are unsafe, and many fear a terrorist attack on the food supply. How can the food industry and the FDA reassure consumers? DA: I think the short answer is to communicate to consumers the extent to which preventative controls have been put in place. It isn’t a matter of saying, “Trust us, we’ve got it taken care of.” Consumers don’t respond well to that; I don’t respond well to that. We have to demonstrate through a clear articulation of what’s been done, so when we say that we have a program in place to make sure seafood from China is safe, we have to tell them exactly what we are doing and explain the process. The key is not only to determine what preventative strategies are going to work, but to articulate and communicate them to consumers. Now, we’ll never get to the point where foodborne illness is zero; it’s beyond the bounds of possibility and research. So, part of this is controlling expectations for consumers. Think about it with regard to fresh produce: You grow something in the dirt, don’t cook it, you know that washing removes a significant portion of bacteria, but not all. There’s an inherent risk associated with consuming foods grown in the ground. The goal is to minimize that risk, but I’m certainly never going to tell you or anybody else that we’ve taken it to zero. That is one way to restore consumer confidence. Another piece to this is when things go wrong – and they will -- we do a better job of communicating to consumers what is going on, what we know and don’t know, what the process is and to get on top of it as fast as possible. Those are all goals in the Food Protection Plan. I’ve talked to people in the food industry, and I believe them when they say it is in their best interest to have a strong FDA. At first blush, you might think they want to be left alone to do their own thing. But the truth is they don’t. They want a strong FDA to provide the leadership, framework and standards for safe food. The big guys are pretty much already there; it’s the little guys that cause problems. That affects everyone. FP: The ability of the FDA to monitor and sample the quality and safety of shipments has been greatly strained and budgets cut, partly because of the war. If you get additional funds, could you tell us what your priorities are and will be? DA: The priorities focus on the three components of the Food Protection Plan. New money is not enough to do it all. It’s essentially a down payment on moving things forward. Under prevention, the money will be used to focus on what preventative controls work best for high-risk foods. Tomatoes and other produce are certainly high-risk, and we need prevention strategies in place. Resources are already being used for a program we call FDA Beyond Our Borders. This relates to how we deal with imported foods. In the past, FDA has inspected food at the port of entry depending on what food and where it has come from. The new strategy is to work with foreign governments, manufacturers and importers to get a better understanding of what’s going on in those foreign manufacturing facilities. That involves focusing on specific countries. We have plans to put an office in China before the end of 2009, hopefully, if the Chinese government concurs and it looks like they will. [China has since granted diplomatic approval for the FDA to open three inspections offices in China.] We will establish the physical presence of a small number of FDA employees, who will be there to better understand the processes within China and do some inspections, but really to integrate into how China operates. We’d like to do the same thing in India, and possibly in South America, the Middle East and Europe. Establishing a presence is a big shift for us, but it’s about building in prevention. Under the intervention part of the plan, the new money is being used to hire inspectors to do more inspections and focus on developing new rapid detection technology. Both prevention and intervention are built on where the risk is greatest, so that’s where much of the money will go. Under the response part, where you go when bad things happen, there are a number of areas. What can we do to improve the speed with which we respond, improve traceability, and how can we work with industry to develop systems that will help us respond faster? That’s a smattering of where this new money will go. FP: Should the FDA have more authority to demand foods and ingredients sourced from foreign countries/companies have the same food safety standards we demand from U.S. companies? DA: The law stipulates that imported food has to meet our standards. They are required to maintain the same standards as we do in the U.S. if they want to import here. The key question is how do you verify that? Building new information technology platforms at the ports to allow us to better integrate multiple pieces of information about what is going on at foreign manufacturing plants and where the risks lie. That allows us to target the inspections at port of entry to the areas of greatest risk. There is no way that FDA could, or would want, to inspect or test every food item. It’s not a good use of resources, so you base it on risk. Part of the strategy with imports is to gather the information that will help inform that risk based process. Let’s say you have two shrimp manufacturers in a foreign country, how do you know if A or B has high standards? If you know one doesn’t follow requirements, you refuse entry. But if you have information that manufacturer B is state-of-the-art, and don’t know anything about A, the risk from A is greater than B, and you would test products coming in from A.
FP: In order to do more testing of foreign made ingredients, the FDA will need more staff. Do you anticipate the implementation of user fees? And is it feasible to bring experienced retirees back into the system on a part-time basis? DA: First, to do this work, we do need more people both on the science and inspection side and part of the money is being used to hire more people. To do that, we need resources. User fees are an option, but there are pros and cons. FDA has not taken a position on them per se; our main interest is we need the resources. It’s up to Congress to decide where those resources come from. Some on the Hill have said we need user fees; some have said it needs to be done through appropriations. I look at it and say, just give us the resources. In terms of retirees, there are two parts to that. People who retire usually retire because they want to retire. Assuming they want to keep working, we do have an infrastructure within FDA that uses these seasoned veterans from the agency. There’s a very well-organized Alumni Assn., and we use ex-FDAers to go out and provide technical assistant and talk about our regulations. We use them particularly in overseas travel, because they have more time and are content to do a week’s worth of work for FDA and take off the next week. We can’t do that; you do a week’s worth and you have to come home. Many of them love it. FP: Consumer Packaged Good (CPG) companies are making more demands on what is already a very complicated supply chain that involves other countries, shipping, and tighter quality control efforts up and down the line. What more should they do, and how can they work together with FDA? As for how food companies can work with the FDA, we can’t work well with 300 different systems. We need a consensus on interoperable systems for supply chain management and traceability that’s actually going to work across the board. A final thing, and where there is some discussion, is how do we leverage off each other’s information without compromising each other’s information? Industry has a huge amount of data and information they are reluctant to share with us. They don’t want us to take regulatory action based on information they have. Similarly we have confidential information we can’t share. We all have a ton of data, but how do you analyze and utilize the information we already have, and how can we work together to leverage off each other? That’s hard, but we have to build trust. Building trust is ultimately what’s going to make this work with industry. FP: The European Food Safety Authority (EFSA) has an outreach program with its trading partners. The FDA has been somewhat isolated in the past, and is that changing under your watch? Is there a possibility of integrated labels? DA: At a higher level, there is a lot of conversation going on within the FDA and between FDA and other parts of the world such as the EU on how we can look at unifying approaches and leveraging off what each other’s got. The focus has not been on labeling specifically. One of the key parts to that is, how can we share the information we have and leverage off it? An example would be that if the EU had been to a foreign manufacturing facility and found problems and FDA needs to inspect the same plant, it would make a lot of sense to build relationships so that we don’t have to go in right behind them – we could share the information and leverage off each other’s resources. That might ultimately translate into uniform labeling. I don’t know; we are operating at a higher level here. It makes no sense for every developed nation to duplicate what every other developed nation is doing. Again, that means developing trust and transparency between regulatory agencies. That’s an active part of planning right now in the FDA – how can we do that? I’ve met often with the Europeans, likewise with the Canadians, Australians, New Zealanders and others. FP: The FDA allows ingredient suppliers to do private research to self-affirm their ingredients GRAS (generally recognized as safe). Why doesn’t the FDA review the research and officially confer the GRAS designation? DA: When a firm submits a GRAS self affirmation, the FDA issues an opinion. To do that, FDA scientists review the science. The opinion may be “no questions” – they take it as being OK. Or “we have questions” [means] we’re not comfortable with what you’re doing. So there is already a review process when someone submits a GRAS petition. There is not a requirement for a firm to submit a GRAS petition, but they choose to do it because if they get an affirmation from FDA, they are free and clear. If they don’t do it, put a product on the market and we find out, check it out and find a problem, they are dealing with a recall and all sorts of headaches. The most expeditious way is to submit a GRAS petition, but it’s not a requirement. FP: Some say the FDA is not doing enough to ensure food safety, but isn’t it ultimately the responsibility of food companies to ensure the ingredients in their products, no matter where ingredients come from, are safe? DA: Industry has a responsibility to produce safe food – from farm to table. Anyone who’s handling food has the same responsibility, whether you are a farmer, preparing food for the family, or anyone in between. The expectation for FDA is that we will set the standards and ensure those standards are being met through some program of preventative controls, which we validate, through inspection and sampling, and when things go wrong get on it quickly. It’s a team effort. The ultimate responsibility for producing a safe product is with industry. FDA’s responsibility is to oversee that, make sure companies are setting the right standards – FDA’s standards -- ensuring they comply, and when they don’t, getting in there and taking care of business. FP: Some in Congress are calling for a single food agency. Do you think that is a good idea? DA: It depends how it’s done. 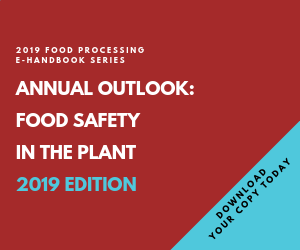 USDA and FDA are the primary food safety agencies; USDA – meat, poultry and egg products and FDA – everything else, and there are other agencies that do things around food; no question about that. The statutes and laws that control USDA and FDA are very different. The biggest concern about creating a single food safety agency is that if you do it by just moving the boxes around, there would be no point. To do it right, you’d have to come up with an approach that builds a new infrastructure with new statutes and laws that integrate the two. You’d have to make sure it was adequately resourced and had adequate authority. Then there would be more logic to a single agency. But there’s no guarantee it would work better or that food would be safer. That’s the downside. Food safety is an ongoing, continuous problem, and during the reorganization of a single agency there would be a period where I’d be concerned we’d have greater risks because essentially what you’re doing is reshuffling the deck. You’re taking apart systems that work to create one you hope will work. Other countries, which don’t have such sophisticated food systems, have done this. No one would design it from scratch the way ours is, but it’s evolved over 100 years to be what it is. There are pros and cons to a single food agency, but the bottom line is if it’s not done right, I think it would make foods less safe. FP: When you became a physician, did you have any inkling you would become the U.S. Food Safety Czar – how did it happen? DA: It evolved. I started as a physician in England initially in internal medicine and specializing in infectious diseases. I always had an interest in research, and many of my patients had foodborne illness. In the late 1980s, I had an opportunity to come to Tufts University to focus on the science of e-coli. I became enthralled and fascinated with that, and decided to continue living and working in Boston to focus entirely on and understand the molecular pathogenesis of E-coli 157. I did that until 2002, when I took it to the public health arena with a position at FDA. One thing built on another – about 10 years as a physician doing infectious diseases and understanding the disease process and clinic illness, then getting into how do these bugs work and make you sick on a fundamental molecular level, and then putting the two together to fix the problems. It’s a big challenge, but a heck of a lot of fun. Calling it a heck of a lot of fun trivializes food safety and people getting sick; what I enjoy is the intellectual stimulation of solving complex issues. It’s long hours, late nights, working through weekends, it never stops, so it is a passion. I very much enjoy what I do; it has huge challenges; we get regularly beaten up for not doing it well enough or fast enough. I enjoy these opportunities to sit down one-on-one with the media to help people understand what makes me tick and the challenges and complexities we face. It helps get the word out that the FDA has a human side, we are consumers, have families and we do care. We are not just faceless bureaucrats pulling a salary and working as few hours as possible. FP: What are the issues keeping you up at night? DA: Food safety. How do we make the system work better and integrate complex systems within FDA, which is why the Commissioner created my position. The Food Protection Plan we put together is a piece of paper with a bunch of words. It’s not until we drive that down to specific deliverable action items that makes change that will have made a difference. Other than that, it’s all talk. That’s what keeps me up at night. How do we take that strategic vision, which I think is a good one, and drive it down to real change and difference? And how can we improve consumer confidence and food safety, while recognizing that we will never solve it all? FP: In only one year on the job, what is your greatest accomplishment? DA: I still have a job. Seriously, it’s getting out the Food Protection Plan as a written document with new legislative proposals in six months. That’s a big deal. To actually identify 10 areas where we at FDA believe we need new authority; we don’t do a lot of that. And we’ve laid it out in the context of this strategic vision of Prevention, Intervention and Response. Even our critics have said this plan is good and solid. That was probably the highlight of the first year. I think the second highlight is the recognition that FDA needs more money for food safety, and hopefully more money will be forthcoming. Without that, this plan will not be implemented. We’ve had small successes as well – strategies to try and build the FDA beyond our borders. In November we need to get the specific implementation pieces of the Food Protection Plan better articulated. It’s been a huge challenge to build a plan ensuring the safety of 80 percent of the food supply for 300 million Americans. That’s the challenge, but it isn’t something you can do in a few months.